Our lovely wear it pinker Lisa shares her wear it pink story with us – everything from starting off small, bringing it to the work place and what drives her to do something so amazing. In July 2013 I was diagnosed with breast cancer and my whole world came tumbling down. I had convinced myself that these things happen to other people, not me. How was I going to cope and continue to have a normal life? How was I going to break the news to my family? Telling my two young children was the worst thing I’ve ever had to do. I underwent a lumpectomy after advice from my consultant that he was confident he could get it all. We were hoping that this would be the full extent of my treatment and hopefully I would return to my happy, normal life after that. However it was found that the cancer had spread to my lymph nodes, so a second operation was necessary to remove these from my right underarm. I received chemotherapy, where I lost my hair and have never felt so ill in my life. Following this, I went on to have five weeks of radiotherapy and although not quite as severe as chemo, it still had its symptoms. I survived this treatment. But I was lucky to come out the other end. 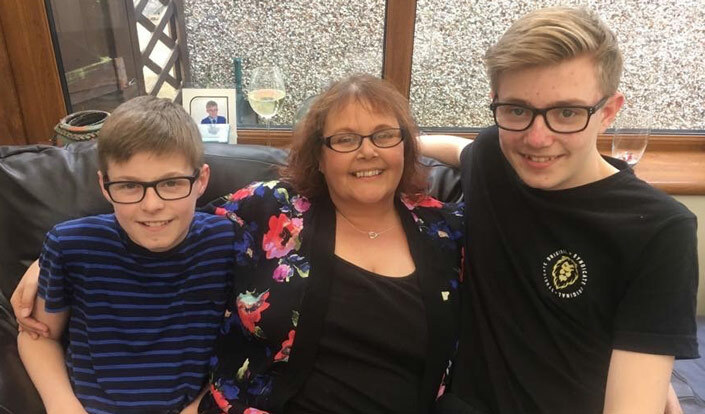 Our whole family were relieved, happy and elated that all treatment had finished and now I could concentrate building my strength and energy levels up – by now it was April 2014. I was treated so well by my family, friends and healthcare professionals; the doctors pulled out every stop in my frequent check-ups to help me regain my strength. It was then that I decided I would like to give something back and started to look into cancer charities, especially breast cancer ones. The first event I took part in was Dry January in 2014 while still undergoing chemotherapy, then in June that same year I ran the Race for Life in Lancaster with a group of friends and family. We named ourselves the ‘Barrow Boobylicious’! After that I decided to host my first wear it pink party. I did this at home and it was a very successful evening; raising about £300. I prepared sandwiches, cakes, bought raffle prizes and we played a few games. I didn’t charge a certain amount for anything, asking for a donation was enough. In my experience I’ve found that people tend to give more if you don’t put a price on things. In the summers of 2015 and 2016 our Barrow Boobylicious team got together again and decided to have a go at the Pretty Muddy challenge in Preston. And last year I decided to do the wear it pink day again, but this time I wanted to expand the event and try something new. As I work as a lunch time supervisor in a primary school I asked if we could create an event day there. We organised that the children could come to school wearing something pink with a donation. In the playground we got pink crepe paper and decorated all the trees with ribbons to really make the day special. We held a ‘Danceathon’ for each class and there were card tiaras that the children could decorate. At the end of the day they could bring another donation and buy some cakes. All the children loved the day and it raised over £450. Since then, in December 2016, I have been diagnosed with incurable secondary breast cancer in my liver. I’m now on chemotherapy tablets and my family and I are coming to terms with the news. But I’ve asked myself in the face of this devastating news: what am I going do? Well, this year I’m hoping to get our Barrow Boobylicious team together for another Pretty Muddy race and I definitely want to do another wear it pink event – even bigger and more exciting than before! So I’d best get my thinking cap on, hadn’t I? It’s thanks to our amazingly brave supporters like Lisa that we can continue to wear it pink for breast cancer research. If you’d like to join Lisa and thousands of others and wear it pink this year, please contact us.